Enova Tech Conference Leads to Ideas and Insights - Enova International, Inc.
On Friday, January 31, the Enova technology teams assembled off-site at the Holiday Inn Chicago Mart Plaza with the goal of assessing 2013’s successes and focusing on the outlook for 2014. Hosted by Enova’s Chief Technology Officer Fred Lee, the all-day conference featured talks from Lee and other Enova tech luminaries like Chad Slaughter, Erik Peterson, Hettie Dombrovskaya and Brian Shirai. Enova’s focus on technology and its position as a tech company require a lot of behind-the-scenes planning and consideration. Beyond that, it necessitates that employees be given the freedom and opportunity to collaborate with leadership on the future. 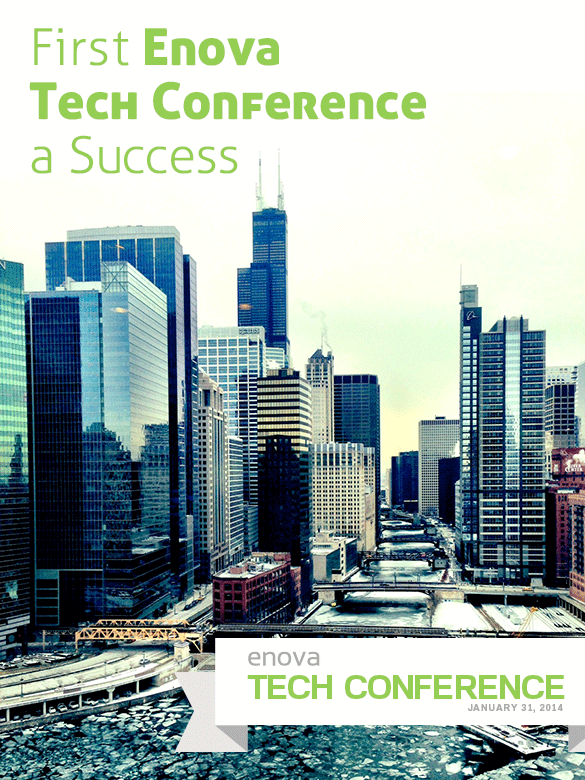 Events like the Enova Tech Conference are created for this purpose, and with the success of this year’s event, we’re sure to see more and more opportunities for Enova employees and their leadership to get on the same page.